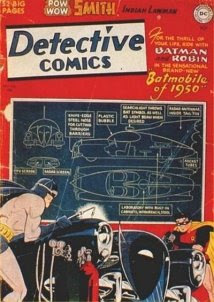 I Believe In Bat-Mite: "The Batmobile of 1950"
I love Sprang's art in spite of his unfortunate name. I've told this story on the Net before but my wife and I were priviliged to be at an interesting event about 18 years ago at a ChicagoCon. We were having breakfast in the hotel restaurant at a table next to Mr. Sprang. On the other side of us sat DC's then-publisher Jeanette Kahn. As we eavesdropped, the bearded Mr. Sprang slowly stood and crossed to the other table, politely introducing himself. It's my recollection that Ms. Kahn and her party were properly worshipful. A most enjoyable bat-blog, btw! Ha! Great story. I never had the opportunity to meet Sprang as I didn't become aware of his art until after he passed away. Among the Golden Age Batman artists, he is definitely my favorite. Thank you for the kind words about the blog, I'm having a blast doing it.